On Thursday 29 and Friday 30 November, the Embassy hosted consecutive receptions to celebrate the decoration by the Government of Japan of two individuals for their valuable contributions over the years to Japan-UK relations. The first gathering, attended by 125 guests, was in honour of Mr Christopher Purvis, who recently received The Order of the Rising Sun, Gold and Silver Rays from His Majesty the Emperor of Japan. Following a highly successful career in financial services, Mr Purvis has since distinguished himself in the non-profit sector. 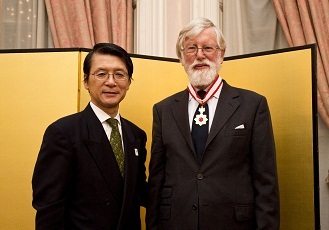 In Anglo-Japanese circles he is perhaps best known for his role as Chief Executive of "Japan 2001", a large-scale series of events that introduced Japanese arts and culture to around three million people all over the UK, for which he was awarded the Foreign Minister’s Commendation from Japan as well as the CBE in 2002. In his speech, Ambassador Hayashi recalled that he had first met Mr Purvis and his wife Phillida when stationed in London in the mid-1990s through the latter’s energetic involvement in activities aimed at fostering reconciliation. He then became aware of Mr Purvis’s links with Japan stemming from the time when he ran the S.G. Warburg office in Tokyo, and their friendship developed steadily. Thus, when he returned to the UK in 2010 prior to becoming Ambassador, Christopher and Phillida Purvis were among the first people with whom he made contact. As well as touching on "Japan 2001", Ambassador Hayashi recounted the various other ways in which Mr Purvis, with the constant support of his wife, had contributed to strengthening the ties between our two countries and peoples. 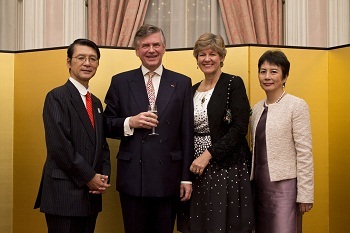 He referred to the six years Mr Purvis spent as Chairman of The Japan Society, from 2006 until this year, during which he helped put the Society on a more stable financial footing, thus enabling it to expand its activities and step up its contribution to Japan-UK cultural exchange. Furthermore, following the Great East Japan Earthquake and Tsunami, Mr Purvis set up a relief fund to aid the victims of the disaster and visited the stricken area personally to familiarise himself with their needs. He is still involved with the relief effort. The following day 88 guests were present to see Ambassador Hayashi confer upon Sir Ghillean Prance, an acclaimed botanist and ecologist, The Order of the Rising Sun, Gold Rays and Neck Ribbon. Before the ceremony, Ambassador Hayashi spoke of Sir Ghillean’s many professional achievements. After 25 years at The New York Botanical Garden, in 1988 Sir Ghillean became Director of the Royal Botanic Gardens in Kew, a post in which he served until 1999. It was during his tenure there that his professional involvement with Japan began. He visited Japan to be a speaker at British Day at Expo ’90 in Osaka, the first international horticultural exposition ever held in Asia, for which he had helped in the arrangements for a British Pavilion. The UK’s links with Japan in the realm of plants and conservation subsequently flourished, leading to the achievement for which Sir Ghillean is best known in a Japan-related context, the restoration of the Japanese Gateway at Kew. A four-fifths replica of the Nishi Hongan-ji temple in Kyoto, the edifice was first made for the Japan-British Exposition held in London in 1910, after which it was moved to Kew Gardens. By the late 1980s, however, the Gateway had deteriorated to an alarming degree and Sir Ghillean worked closely with Japan to co-ordinate the restoration project. In 1996, thanks to his efforts, the restored Gateway was opened by Her Imperial Highness Princess Sayako, in the presence of Her Royal Highness The Princess Alexandra. Ambassador Hayashi also recalled a ceremony at Kew Gardens this April in honour of the victims of the Great East Japan Earthquake and Tsunami, attended by British volunteers in the relief effort as well as two children from the stricken region. Two keyaki trees, symbols of Miyagi and Fukushima prefectures, which bore the brunt of the disaster, were planted in the garden, while some seeds from the “miracle pine” which alone survived the gigantic impact of the tsunami against all odds were donated to Kew’s Millennium Seed Bank, which Sir Ghillean had played a key role in setting up. Among his contributions to Japan-UK relations in the areas of biology and botany, Sir Ghillean was involved in an exhibition on endangered plant species jointly staged by Kew Gardens and The Association of Japanese Botanical Gardens at a department store in Tokyo, attended by Their Imperial Highnesses Prince and Princess Akishino as well as Prince and Princess Hitachi. He also escorted Their Majesties the Emperor and Empress of Japan on two visits to the UK: in 1998, when they visited Kew Gardens and the Linnean Society in London, and earlier this year when, having participated in the celebration of Her Majesty The Queen’s Diamond Jubilee, they visited Holland Park in London. On receiving the decoration from Ambassador Hayashi, Sir Ghillean first gave credit to his wife for having introduced him to the people of Japan through a friendship which she developed with a neighbouring Japanese family while they were living in New York. She helped the wife and children with their English and afterwards extended her teaching activities to many Japanese businessmen, their wives and children, thus ensuring a steady supply of Japanese friends. Recalling the Expo '90 in Osaka, Sir Ghillean described it as “a magnificent display on the theme of the harmonious co-existence between humankind and nature”. His work on that project led to him being awarded the first International Cosmos Prize, which His Imperial Highness the Crown Prince bestowed upon him in Osaka in 1993. For the last ten years he has served on the committee that chooses the recipients of that Prize. Sir Ghillean also recalled with particular pleasure the state visit of Their Imperial Majesties the Emperor and Empress of Japan in 1998, when he was the organisation’s President. He escorted the imperial couple around the premises of the Society, of which His Imperial Majesty is an honorary Fellow, and guided them on their visit to Kew Gardens. He was extremely impressed with His Imperial Majesty’s knowledge of biology, as he was more recently when he escorted him around Holland Park, when they discussed the conservation of species in an urban environment. In conclusion, Sir Ghillean declared: “Our two island countries have a lot in common, and the more we can do to encourage fellowship between our peoples the better the world will be.” Thanking His Imperial Majesty and the Government of Japan for the huge honour they had conferred upon him, he vowed to continue his efforts at fostering stronger Anglo-Japanese relations “in any way possible”. This month, Ambassador Hayashi will also hold receptions for Prof David Cope, decorated with The Order of the Rising Sun, Gold Rays with Rosette, and Mr Roy Edward Hurst, decorated with The Order of the Rising Sun, Gold and Silver Rays.